We are pleased to announce that Mind have been chosen by members to be our industry sector’s charity for 2018/19. Figures released by the Office of National Statistics show that the incidence of suicide among roofers, tilers and slaters is 2.7 times higher than the national average. Shockingly, between 2011 and 2015, ONS data shows 2,757 people working in the roofing industry committed suicide – compared to 217 fatal injuries in the same period – 97 of which were caused by a fall from height. Tackling this issue will need to form part of a long-term campaign across the industry, but as an association we have also committed to supporting a mental health charity throughout 2019. LRWA will be raising funds for this important cause through donations at the annual LRWA Awards & Gala and other events. In 2017 we chose to donate to Find A Better Way, a charity founded in 2011 by England and Manchester United legend Sir Bobby Charlton. While visiting a minefield in Cambodia, Sir Bobby saw first-hand the humanitarian damage which landmines cause in war torn areas both past and present. 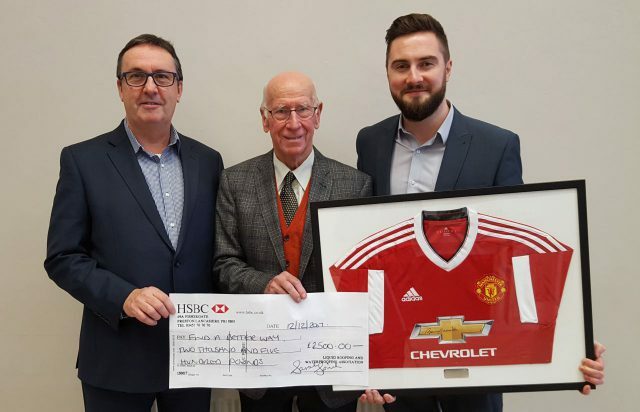 Cliff Weston, Chairman of the LRWA presents Sir Bobby Charlton with a cheque for £2,500, along with the winner of the charity auction at the LRWA Awards and Gala Dinner 2017, David Broom of Moy Materials, the proud owner of a Manchester United shirt signed by Sir Bobby. The video below is both powerful and moving and explains why this was such a worthy cause.